The theme for this month has been transparency. When we started planning the themes for each month of the blog series back in January I wasn’t sure what I was going to write about when the topic of transparency came up. What do we mean with transparency, what’s the issues at hand? Aren’t people helping each other out? Since I had many questions and the construction industry at large is quite new to me I decided to turn to my father. He’s spent the majority of his working career in the construction industry and I figured it was a good place to start. While I thought I was going to be asking the questions he turned the tables on me and instead asked; What is it that motivate you at Geometra? This is where transparency enters into the mix. 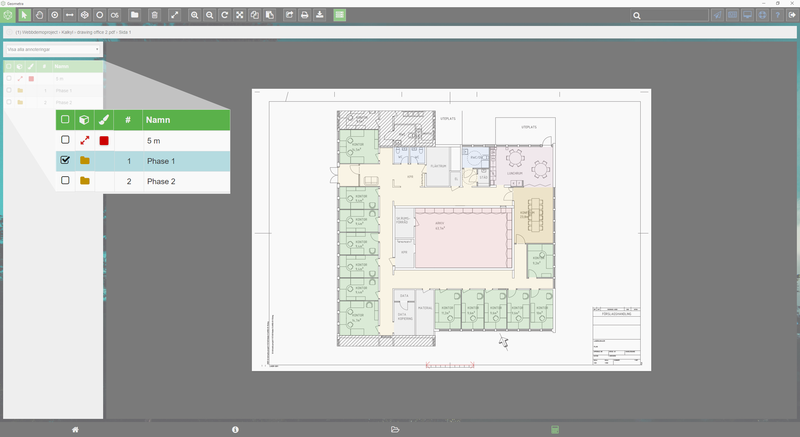 By opening up information between parties in the industry, for example main contractors, subcontractors, estimators, project leaders and supervisors, we could achieve massive efficiency increases on a wider scale. We’ve seen one part of the problem with our userbase where everyone seems to have a mentally that every player must do their own takeoffs for each project. This is insane, who’s actually benefitting from this? Geometra is far more than just a simple takeoff tool. 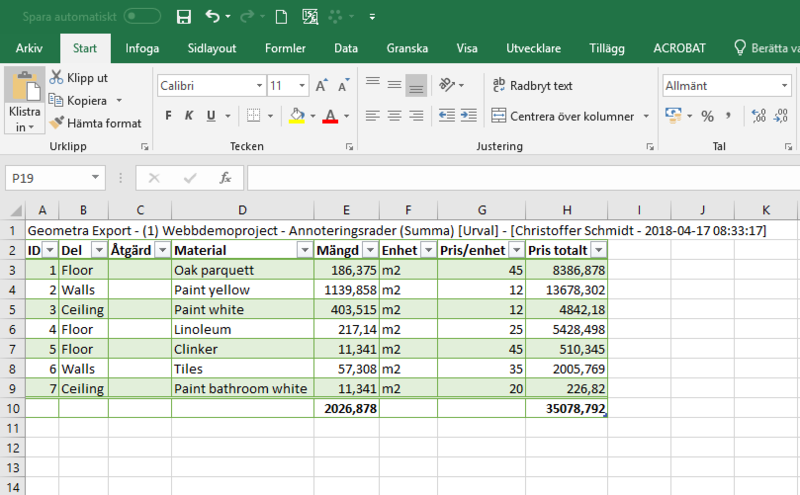 Fredrik passed the torch to me in last weeks blog to expand on how to use Geometra to promote transparency in your organisation. The service Geometra gives your great opportunities to live up to your organisations true potential. 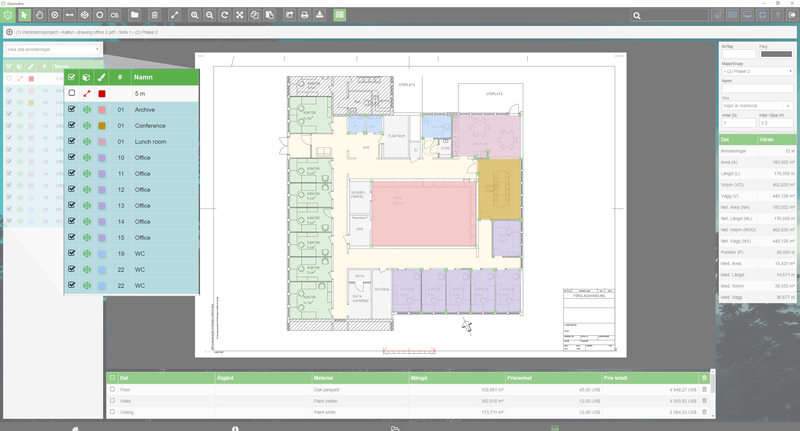 It could be as easy as making use of the estimator’s expertise and making sure it’s forwarded onto production management in the best way possible. Giving production management a better starting point will result in increased control and understanding, better time management and improved economic results. We’re noticing all over the industry that the knowledge from all sides of the organisation isn’t being used to its full potential. To open up and reveal yourself isn’t easy or obvious for everyone. While it might be quite an ordeal there’s so much to benefit from doing it. The whole “everyone-needs-to-do-their-own-takeoffs”-culture is in part a way of saying that you don’t trust your colleagues and partners. People in the industry are hired to think and solve problems, to do this efficiently you need information, preferably correct information, but still. This is achieved by transparency. If you’ve ever thought “Why didn’t they do it my way? That wasn’t very efficient” this could be a tell-tale sign that transparency is lacking in your organisation. Start talking to each other! If you want to read more about transparency check out Marcos blog; Let’s talk: Transparency! 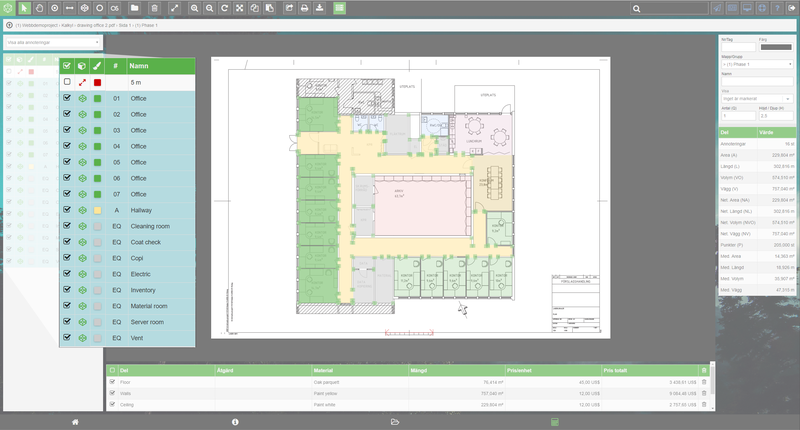 In Geometra you can easily structure your estimate and project in for example four dimensions; Time, Place, Phase and Part/Room. Really, it’s only your imagination that puts a limit on what you can do. Our philosophy is that build your structure in such a way that it can be reused further down the line in the project. What would project management want to see and why for example? When the estimate is complete, forward the entire thing to production management. 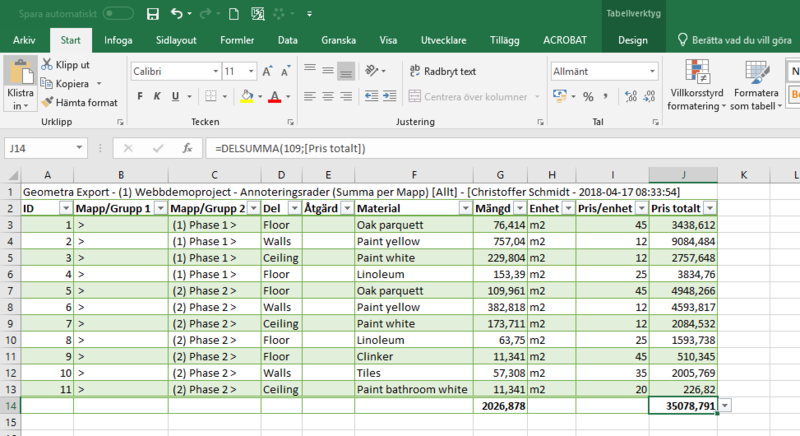 All the information on how the estimator has tried to solve the project is right there, and any project leader that has access to that info will be better off when starting the project. This also means that project management won’t have to redo the work the estimator has already done and can’t instead focus on solved problems in the future instead of repeating the past. Initially I think a lot of people will find it scary to share information like this, where everyone is able to scrutinise and verify, but also contribute and participate however I’m convinced that in the long run you’ll be positively surprised of what happens when communication starts to open up. Project management can now focus on finding optimisations for the project like managing material supply in a way as to only have just the right amounts and not bind monetary assets unnecessarily. It’ll create less discrepancy; more control equals more time and money saved. If we’re able to save time, being a generally piece rate system-based industry, as an organisation we’ll make more money. Craftsmen will increase their pay check and stay happy, project management can deliver a better project result, the estimator will be praised for his/her ability to structure the project and organisational management will be happy and share holders will be able to profit from dividends. Everybody wins! Whatever you do, don’t forget about all that juicy data you’re building about yourself, your project management and your business. This is a very potent database that will provide you with valuable insights into how to structure, estimate and project manage your future endeavours. Food for thought! Below you’ll find an easy example of how to structure a project and set it up in a way to provide an easy start for project management. The way Geometra scales with project sizes is amazing and it’ll provide you with unlimited possibilities down the line if used properly. 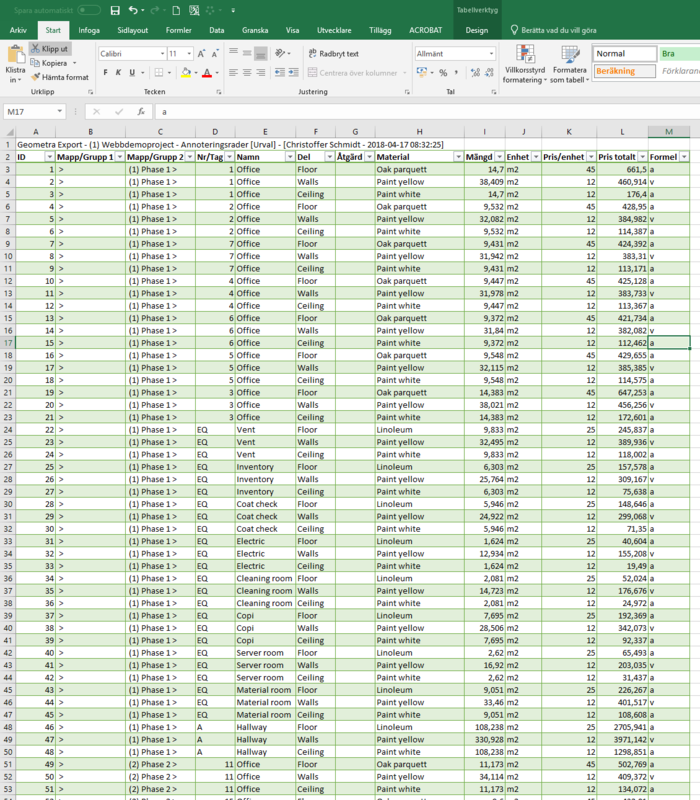 Note that the right column shows how the amount is calculated, giving the people who are going to do the work a good insight into how the amounts in the project are calculated.